The Upper Creggan parish logo is the beautiful Shrine or metal box dating from c. 1100AD which was made to store / protect the ancient bell of St Patrick. The Shrine of St Patrick's Bell is on permanent exhibition in the National Museum in Dublin. This beautifully crafted ornate metal case is hollow in design with a sliding lid to enable the bell to be removed. The Bell itself was last rung at the Patrician Ceremonies in 1961 and for the visit of Blessed Pope John Paul II to Ireland in 1979. The shrine is long associated with Irish devotion to our national apostle, St Patrick, who is the patron of our parish and in whose name the motherchurch of the parish is dedicated in Crossmaglen. Representations of the Bell Shrine are to be found in the glass panels at the entrance porch of St Patrick's and in a glass screen at Sacred Heart, Shelagh. 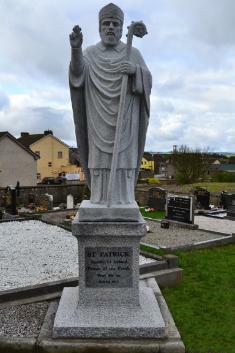 A statue of St Patrick is among those on the facade of St Brigid's, Glassdrummond as well as at the front of St. Patrick's, Crossmaglen. Christ be my friend forever and ever.